If you have not figured out by now... Yes, today is my one year blog anniversary! YAY! It has been a true blessing to be able to have this venue to express myself and not only receive feedback, but get to know all of you. I have made so many contacts with other bloggers that it is amazing. I have learned a lot and have had a blast getting to know so many of you. 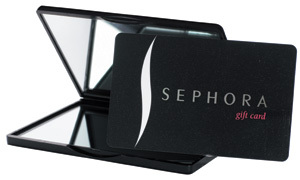 Because I love Sephora so much and it has a variety of products in one location, I thought a gift card from Sephora would be a PERFECT giveaway gift! Must be a follower [Google Friend Connect] of FabEllis. Must include your e-mail address in the comment. This is open to international followers. December 25, 2011 @ 11:59 p.m. Thank you again to everyone who follows my blog! Good luck & God bless! If sephora is where you get all your lovely makeup then that gift card should be mine. Hey love sephora, this is awesome. Congrats on one year! Congratulations on your anniversary, I know mine is approaching soon as well. A Sephora gift card was such a great idea because every girl loves to feel fabulous! Congrats on your 1 yr! oooh congrats on you blogiversary and the giveaway! Happpppyyyy Blog Anny!!! and YES, enter me pleeez!!! I follow via gfc! Who doesn't love a little sephora? Thanks! Love reading your blog :) Congratulations on your success! Thank you so much for sharing this wonderful giveaway with your followers! Congrats on the 1yr anniversary! HAPPY ANNIVERSARY!!! AND HAPPY HOLIDAYS! Congratulations on your anniversary. Blogging takes dedication and hard work. congrats on your 1 year!! that must be so exciting! keep up the great work! Congrats!!! I am a follower now. I thought I was already one. Congratulations on your 1st year anniversary. I appreciate the hard work and dedication required. Here's to many more years.